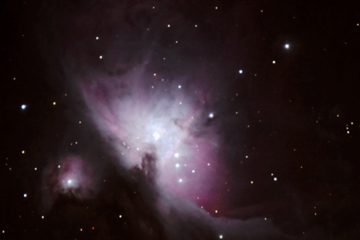 September 19, 2009 Imaged M42 with a Nikon D90 and 8" f/5 Celestron reflector telescope and a Baader coma corrector. 65 ten second images. These images are 3216 x 2136 and may take a long time to load. September 13, 2009 Imaged M13, M27 and M57 with a Nikon D90 and 8" f/5 Celestron reflector telescope after installing a new low profile Crayford two speed focuser and a Baader coma corrector. It all worked very well and I now have a fairly decent flat field across the large focal plain of the D90, along with the ability to accurately focus the telescope. 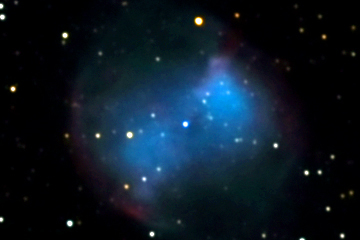 These images are comprised of 40 to 70 individual ten second images which were stacked in Registax and color saturated in Adobe.